Tibet is cautiously opening up to the western world offering travel seekers a fulfilling authentic experience, which can be adventurous and unpredictable due to the lack of infrastructure which is poor to non-existent, making a simple road trip a complete adventure. The majority of this land rests above 4000 meters (13,000 feet), housing many secrets which present the perfect opportunity to explore the highest Himalayas in the world giving you ultimate thrill of climbing, trekking and other challenging adventurous activities. This twelve days tour combines four nights in the spectacular capital of Nepal, Kathmandu, with a elevan nights tour of Tibet including Everest Base Camp from Tibet side. This is the most popular tour in Tibet as this tour covers almost all the highlights of Tibet. 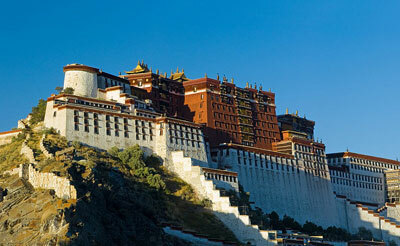 Lhasa Sightseeing Tour There will be 4 flights in week usually from April to October i.e. Sunday, Tuesday, Thursday and Saturday and possible to have a 2 days to weeks trip based on two way flight. The program below is just a model one and possible to change program as per your interest, time and budget. athmandu – Lhasa - EBC Tour is the most popular to Tibet, and obviously offers you interesting & fantastic holiday as well as in-depth knowledge about the unique cultural of the locals, their religions & their lifestyles. The tour definitely offers you some of the most amazing landscapes, Tibetan villages, charming views of the Himalayas & much more.